There is some truth in the common saying that all work and no play makes Jack a dumb boy, so this having been said all of us need vacations at some point of time or the other so that we are able to recuperate and get a fresh lease on life. If you continue working for years on end without a break then chances are that you will not be able to do your best as well as reach your full potential. 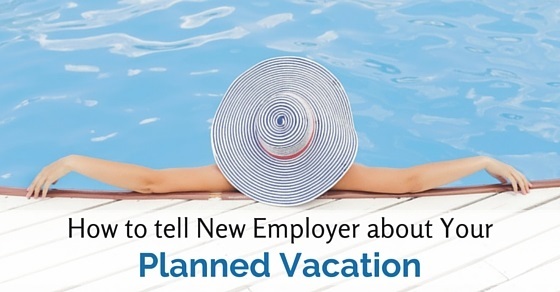 However, telling your employer about a planned vacation becomes tough when you are a new employee. Here are some tips to help you do the job. How And When To Mention Your Vacation Plans During A Job Interview? If you are thinking or are confused whether to tell your new employer about your pre-planned vacation, then it is better to inform your employer but in a very graceful and confident manner. Now before breaking the news, there are a few things that you need to focus on. You need to take extra care as you are not even offered a job yet. Usually, no employer would have any such objection when the candidate has such a request. The best part is that employers like candidates who are honest and straightforward. In the event of having to break this news about your planned vacation to your new employer, if you do not plan ahead of time what you are going to say, chances are that you are going to make a fool of yourself. Remember, bosses of any company are busy people and they do not have even a minute to waste. Have everything you are going to say right at your fingertips and practice what you’re going to say once or twice. Make sure that you have your bosses undivided attention otherwise chances are that it will slip his mind entirely. As you are a new employee you should be very clear about what you want to convey, when to and to whom. Present the thing in a precise and professional manner by taking tips from other employees. When speaking to your boss, you must ensure that you do not spend a lot of time beating around the bush otherwise you will not get your point across. Going for a planned vacation is certainly something you should not be sad or apologetic about, so that is why in the course of the conversation with your boss, you should not have a sad and unfortunate look on your face, as if you do so, then chances are that you will come across as being incredibly fake as well as false. When you are speaking to your boss, you should maintain the required professional decorum, yet your stance should be unapologetic. However, in the event of being unapologetic, you should ensure that you do not come across as rude. In the event that you are telling your new employer that you are going on a vacation, obviously, he or she is not going to be ecstatic at the news. Chances are that he will not prevent you from going, yet at the same time, he might try his best to try and persuade you not to go at all. However, you should ensure that you hold your ground and do not get deviated in the least bit. The moment that you show some kind of weakness people are most certainly going to try and exploit you for their own purpose as well as benefit. Always look into your own needs. While having this conversation with your new employer, you must guarantee your boss that you will make up for lost time, by being even more proactive when you do return. This does not imply that you say that you will be willing to work overtime when you return as this is something which isn’t practical and is absolutely unfair. Making up for lost time merely implies that you will come back with a refreshed attitude to work and you will be able to get more done. We all know that the benefits of taking a vacation are manifold so you should go ahead and look forward to the fun time. When you are having this conversation with your new employer you should mention that this vacation has been planned a while before, even before you joined the company. Do not forget to mention that this is a trip which you have been looking forward to for a long while and you have invested a great deal of both your time as well as your money in ensuring that this planned vacation is going to be a great experience for you. In the event of your trip being a family vacation you should mention to your employer that this is a family occasion of sorts which you cannot pass on. No matter how business oriented you are, or how much you wish to climb the ladder of success, you should not forget your family and you should try your very best to maintain a work-life balance. What you should remember is that in future, if you miss out any family occasion, then in time to come you might regret this. As you go on in life you will remember that there is nothing more important than family and your family will always stick by you. When you are a new employer you should constantly be on your best behaviour and try you’re very best to set a good impression at the very onset. If you are someone who is confident as well as speaks well than chances are that you will be much loved as well as adored in your place of work. So rather than trying to overthink about the matter at hand just put forth your words in a clear and concise manner and you will be respected. Employees should be respectful toward their employee yet at the same time they should not be afraid to speak your mind. What you must ensure is that you are honest and at no point in time should you utter any kinds of falsehoods as that will reflect badly on you. No matter how bad you are at confrontations you should never resort to something as low as lying or hiding facts. Many times we consider telling lies like, someone in my family is ill that is why I have to visit him or her, but telling lies is absolutely unnecessary as in the event of being caught it could be quite an embarrassing situation for you. Companies are always on the lookout for employees who have high integrity. Very often it might just happen that you never had the chance to take a break between two jobs and hence you begin your new job feeling a little tired as well as saturated. If such has been the case with you, then you should absolutely not shy away from mentioning this fact to your employer and stating that this is something that will really help you a great deal. Taking a break in between jobs is something that is absolutely vital such that you are able to take much-needed rest as well as get out of your old routine and prepared for the adventure lying before you. Chances are that your new employer does not know much about you or even about your manner of working. So you must make it a point to let him or her know that it is not often than you take vacations or even leave for that matter. As long as you show that you are someone who is very interested in the job as well as someone who does take the job seriously, then chances are that your employer will not mind. “Success does not come easily“, is something agreed by most successful people. So no matter what, you have to try your level best to put your best foot forward under all circumstances. It is only you who know yourself best, and you are the one who can decide the best when you are at your breaking point and in desperate need of a break, away from the hustle as well as the bustle of the town. Mention that you are in a desperate need of a break as you have not been able to go on a vacation in a long while. If your heart is really set on going for this planned vacation, then you should not let anything come in your way and you should always have your own interests at heart. After you have been given permission to go, then you should make it a point to mention that you are excited about your planned vacation, yet at the same time you know that this vacation is really going to help you a great deal personally as well. Vacations are great in order to help you get a look at the bigger picture in life and gain some perspective on things which are really important in life, you start appreciating those little things which you possibly never even took notice of before. In the event of making it big in your professional life, you shouldn’t put your personal life on hold. In the midst of such a talk, one of the worst things which you can do is make false promises which you cannot keep just to impress your employee. Steer clear of making promises to Skype regularly and look into work-related matters as that is going to do nothing but ruin your holiday. However just to ensure that you will not be ‘missing in action’ through the vacation period you should make it a point to mention that you will try your level best to be constantly available on your mobile phone in the event of some emergency situation cropping up. Yet ensure you are not burning a hole through your pocket with roaming bills. Lastly but not the least is that you should gather up your courage and ask about any vacation related reimbursements which you are entitled to and which you can make use of. Do not be ashamed of asking such questions as you are well within your rights to claim such benefits. So these are some of the tips which you can follow so that you can easily tell your new employer about your planned vacation. So if you are someone who isn’t good with confrontation you should try your best to pluck up your courage so as to get your point across. In life being timid is certainly not going to get you anywhere, if you show that you are weak and vulnerable then people are going to take advantage of you as after all, the business world is a cut throat one indeed. So hold your head up high and have confidence in yourself then no one can stream roll over you.